That, in a nutshell, is the story of director Chris Terrio, whose debut film opened recently in New York, and which will open around the country in early July. Terrio was energetic and well-spoken when he was in Denver to promote Heights. The movie had premiered in New York premiere only a few days earlier and he was a little nervous about the reviews, although rumors of a good notice in Variety seemed to assuage much of the tension. The longer we talked, the more of his non-film background came out. Terrio’s entree to the world of film was surprisingly literary. Many film schools teach production, storytelling, even finance. My own experience showed me how blue-collar most of the film industry really is. Art and literature too often get lost in the shuffle. So it’s inspiring and vindicating to see Terrio, a Harvard-educated literature major, make it in film. 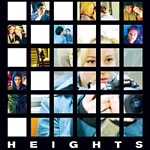 Heights is a Merchant Ivory production. Terrio got to direct it because he had worked in the offices of Ismail Merchant and James Ivory. They knew his student work and they trusted him. “Merchant and Ivory had seen a couple of short films that I had made. They had seen some things that I had written, too. They have a foundation for the arts. They got me to work with the actor Matthew Modine to do a staged reading of a lost play by Christopher Isherwood and Aldous Huxley. And I think they were pretty happy with that. “And then about a month later, Ismail said ‘we have this project that’s been kicking around in development for a couple of years, and we don’t quite know where it’s going. Do you think you can do anything with this?’ He gave me what was then the original script of Heights. And what aspiring filmmaker wouldn’t want it? Being handed a script by one of the most respected producing teams in the business is a dream come true. Then again, most aspiring filmmakers don’t have jobs in the offices of Merchant Ivory Productions. So how exactly does one land such a great job? “To my astonishment, about three weeks later, there was a handwritten letter from him in my box. So when I was back in New York I had dinner with him. He did give me some advice and I went off to USC. “The summer after my first year [at USC], James Ivory needed an assistant on a film called The Golden Bowl. He presumably needed someone with a literature background because the jobs were ‘go find Uma Thurman an Edith Wharton short story to read about how ladies behave in society.’ And I had just come off six years of literature, especially English Modernism. So it was the perfect nerd job for me; I could go off and do that and still be on a film set. So for Terrio, it wasn’t just his skill behind a camera that got him a job in a film production office. It was a working knowledge of English Modernist literature, hardly the sort of background your average Hollywood brat has. “I did undergrad at Harvard in Literature. But because John Harvard went to Cambridge, they have this thing called the Harvard Scholarship Fellowship where they send a couple of scholars from Harvard to Cambridge to do graduate work. You live in John Harvard’s rooms and go to cocktail parties. It’s a fantastic thing. You get travel money. I don’t think I’ve ever been as rich as I was that year. On the Waterfront I've probably seen 50 times and I could keep watching it. Anything by Fellini, especially his more realist stuff like Nights of Cabiria and La Dolce Vita. I can always watch anything that P.T. Anderson does. Even when I don't completely buy the films, there's always so much to admire that I just sit there with my jaw dropped. Terrence Malick is one of my favorites. There's a filmmaker Lynne Ramsay who made a film called Ratcatcher and then made a film called Morvern Callar. She's one of the great new filmmakers. I also like the British social realism practitioners like Mike Leigh and Ken Loach. The movie I've seen more than any other movie is Carl Theodor Dreyer's The Passion of Joan of Arc, because to me the whole reason to do film instead of theater is the close-up. Theater is all about words, and film is all about no words. That and Persona are the master class in close-ups. Even though he now has the first notch on his belt, Terrio still relates to the struggling characters in the film. And although most of us would say he’s graduated from “aspiring” to “successful,” Terrio is carful not to count his chickens. “I still live in my apartment on 96th street with four roommates. It’s not like you make a film and the money truck comes and now you’re off driving your BMW. “Ismail was completely fearless. He really was maybe the only truly independent producer who wasn’t in any way bound to anyone. Ismail didn’t care about what the studios thought, he didn’t care about what agents in Hollywood thought. If he wanted to make a film, he was going to make it. He would beg, borrow, and steal; he would get his dentist to invest; he would just make the movie. It still astounds me that he had the confidence to take... I was almost 26 when he gave me this film... he had seen some of my short films and read some of my writing; he had no idea, but he just thought ‘I have a good feeling so I’m going to let him do this.’ I don’t know anyone else who would have done that.